The Indian Bengal Delta (IBD) is considered to be one of the most vulnerable deltas in the world as a result of climate change. The capital of West Bengal, Kolkata, and its peri-urban and rural areas in the south and east, are facing the biggest challenge of adapting to climate change. The WWF (2010) and the World Bank (2011) reports on Kolkata and climate change have pointed out the possible magnitude of catastrophe the Bengal capital can face due to climate change. In 2015, media reports revealed that Kolkata has the highest level of carbon dioxide emissions out of 25 Indian cities based on their energy consumption pattern. However, data on Mumbai and New Delhi was not included in it. The said media report also indicated that Kolkata is the fourth most vulnerable Asian city, but “comes to number three among those least prepared to adapt” (Deccan Herald, March 12, 2015). Another news report (The Times of India, November 13, 2015) warned that more than 50 per cent people living in the city (12 million) will be flooded out of their homes in case temperature rises to about 2 degrees Celsius. This will put Kolkata at the heart of one of the biggest climate refugee challenges as inundation in Bangladesh will force millions across the border. A roadmap for low carbon and climate resilient Kolkata prepared by the British Deputy High Commission and the Kolkata Municipal Corporation (KMC) with help from UK Aid (2015) shows that the city stands seventh in the global climate change risk list and third when it comes to flooding as a result of expected sea level rise of 25 centimetres by 2030. The roadmap suggests 12 action points: preparedness for disaster, formation of a heat and health action plan, climate-smart mobility, promoting green buildings, rainwater harvesting with a potential of 320,000 million litres, climate-smart land use, better solid waste management, use of rooftop solar panel, energy efficiency, business plan for green livelihood, sensitisation, knowledge exchange to enhance capacity through the newly established cell at the Kolkata climate change cell in KMC and the preparation of ward-wise action plan. To initiate the project, KMC has received approximately US $ 1.2 million after a memorandum of understanding was signed in November 2013. But after more than three years, a search for progress has led to nowhere. No information is available in the public domain either. Close to Kolkata, the Indian Sundarbans in IBD covering an area of nearly 10,000 sq km and having a population of 4.5 million is facing a serious threat. 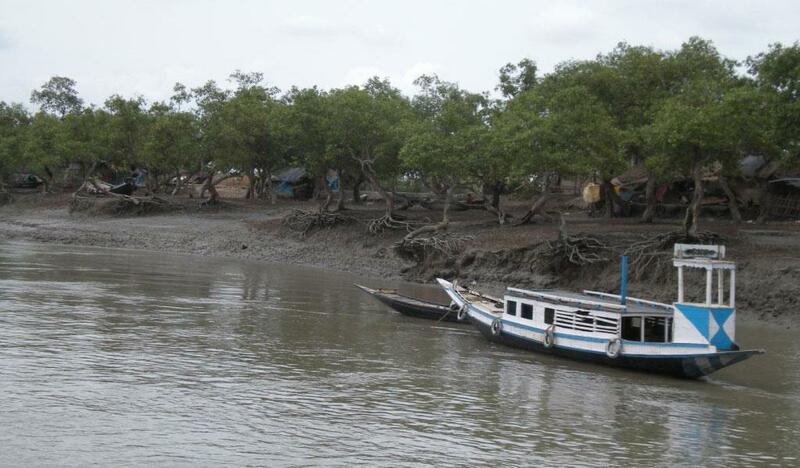 People in the Sundarbans reside in 53 islands. This was revealed in the Delta Vision 2050 document (WWF-I, 2011). Perhaps, one of the major actions needed, is to invest in the planned retreat of nearly 1.4 million people from vulnerable islands and increase mangrove cover as a bio shield against floods and further erosion. But where will the climate-induced migrants go? The new Land Acquisition, Rehabilitation and Resettlement Act, 2013 dealt with acquisition for development and provided power to the people to decide. But for the future climate refugees—whether they are from Sundarbans or from Kolkata—where is such a plan? Forget about relocation of vulnerable population from Sundarbans’ islands, they have hardly been prepared to adapt to climate change. It needs skill development and a master plan for deployment in demand-driven sectors. Over the last three years, nearly 100 professionals from more than 20 institutions in the United Kingdom, Ghana, Bangladesh and India are working to critically analyse the current policies and action plan, plight of climate refugees (both from sending and receiving areas), reasons for their migration and status of rehabilitation and resettlement. Economic modelling and multi-hazard maps have also been prepared to sensitise the authorities concerned about urgent need for action entitled “Deltas Vulnerability and Climate Change, Migration and Adaptation”. The project is being supported by the International Development Council and the Department for International Development, UK. One can only hope that the findings of the project will act as a driving force to get support from developed countries, which are responsible for climate change and help millions of people living in the deltas in not only mitigation but also adaptation and rehabilitation.